Support Rare and Endangered Species in Massachusetts! Home/Uncategorized/Support Rare and Endangered Species in Massachusetts! Make a donation on your MA state income tax return (line 33a) for Endangered Wildlife Conservation. Donate online with your credit card as a “Guest Customer” through MassFishHunt, MassWildlife’s licensing system. Direct donations through this method in 2017 totaled $7,891 dollars, up from $6103 in 2016. There’s plenty of room for improvement! Reflect on the success of the Bald Eagle restoration effort that began in 1982. 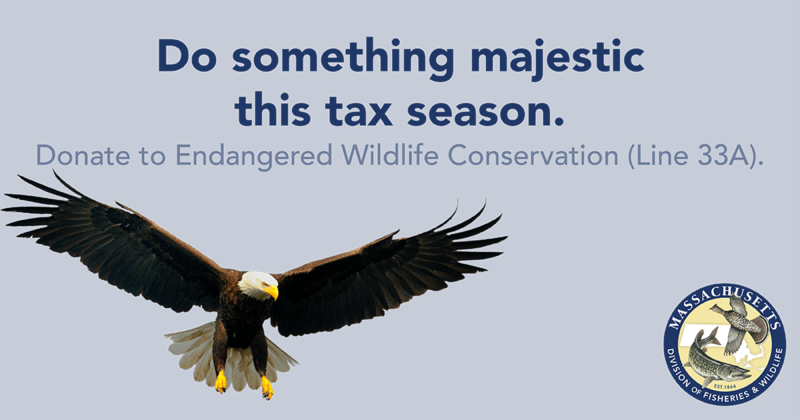 This past year, a record-breaking 76 territorial eagle pairs were documented in Massachusetts! Observations from birders and other interested citizens played a big part in this documentation. MassWildlife depends on reports of eagle nests or observations of eagles carrying sticks from birders like you to monitor these magnificent birds. MassWildlife and others are sure there are more eagle nests out there that haven’t been found or documented. For instance, who will find and confirm the first eagle nest on Cape Cod?! Thank you for your support, whether it’s a donation, reporting observations or telling others about this important program that conserves wildlife for everyone to enjoy! Remember – line 33a on your Massachusetts state tax return!